....I am stitching at the speed of light! 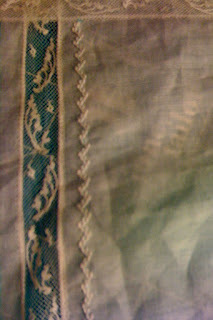 Here is a teeny peek at some featherstitching. This is a rough pic taken with my phone. Sorry for the quality, the card in my camera was full. I will be back in a few days with lots of pictures to show for my efforts. Welcome home! Keep stitching. The sneak peek is gorgeous! Beautiful , Beautiful Featherstitching!! Miss Eula would be proud! I've said it before (somewhere) and I'll say it again - it is impossible to have too much featherstitching on a baby gown. Especially when it is as beautiful as yours. Let's see the rest of those pics!